Dan Mogford, the artist behind the new paperback cover art for the John Gardner James Bond reprints, has posted a blog about how he got the job and approached the new designs. He even gives us a first look at the full Licence Renewed cover art front and back. Read "James Bond Series Designs" at Dan Mogford Design & Art Direction. The first two John Gardner paperback reprints, Licence Renewed and For Special Services, are due for release in the UK on Thursday. 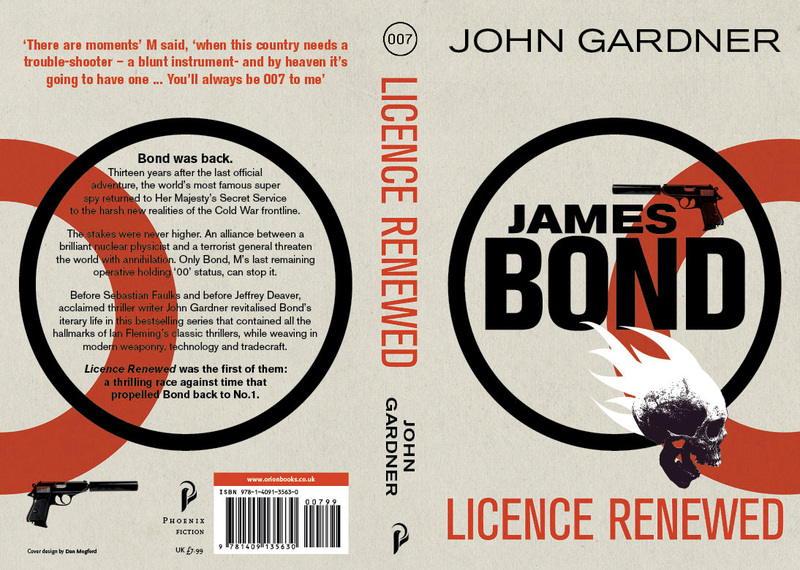 Check out our special Gardner Renewed page for links and the latest release dates for all the Gardner-Bond reprints in the U.S. and UK. Thanks to Luke Freeman for the tip! Looks good! Might be my favourite cover so far. I do hope a proofreader got their hands on the back cover of Licence Renewed before it went to print, though. Typos aplenty! I hope they have proof read it to! Thanks for the heads up on this. Apart from the 'L' missing in literary what else have you spotted? I thought weaponry was wrong but it is not and revitalised is the UK spelling. Just need to know of others I may have missed. Jeffery Deaver's name is spelled incorrectly. It was also spelled incorrectly on the recent hardcover reprints. Oops! The first sentence is a bit convoluted as well, but I suppose it works. Deaver's name is spelled correct on the actual book. In fact, all of the above errors have been corrected. Nice work, Orion! Done. I've also taken it off Facebook. "Deaver's name is spelled correct on the actual book." The Licence Renewed UK paperback. The one pictured above. But Deaver's name is now correct. Looks like all the typos were corrected. Shatterhand, the US paperbacks were announced with art by Fusco but this was scrapped for unknown reasons (although the reaction to the art on forums wasn't very positive). The US are now using something very similar to the UK but with tiny differences. February 2nd 2012 (UK) for differences.